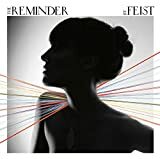 Feist - I'm loving what I'm hearing...and seeing from this Canadian Leslie Feist. This girl's got depth. The more I learn about her, the more I hear her music, the more I like her. Below is the video for her 1,2,3,4 hit, which I first heard on an Apple Nano video Ipod commercial. Yuck! But it's okay. She gained another fan.